Good habits die hard, it seems, after five years of epic drought – for most Californians, anyway. The historic dry spell from 2012 to 2016 prompted many state residents to reduce their water consumption, as did strict regulations imposed by state agencies and individual water districts. Whether they wanted to or not, urban Californians reduced their use of the state’s most precious resource by about a quarter. Now, after mandatory conservation targets were lifted in April following a very wet winter, many Californians continue using less water than they were prior to the drought. In Sacramento, Los Angeles, most of the San Francisco Bay Area and Orange County, urban residential water use is down between 20 and 26 percent since 2013, often used by water agencies as the benchmark year for pre-drought water consumption, according to the State Water Resources Control Board. That said, water conservation is already slacking off a bit – and more in some areas than in others. In the summer of 2015 – the height of the drought – Californians’ savings on water use peaked at about 25 percent of 2013 levels. A report from the State Water Resources Control Board shows statewide savings on urban water use for June 2017 totaled 17 percent. In other words, though we’re still using less water than we were in 2013, our consumption is rebounding. Heather Cooley, the water program director for nonprofit Pacific Institute, says such a post-drought uptick in water use is to be expected. Andrea Pook, a spokeswoman for the East Bay Municipal Utility District, says she expects the rebound in post-drought water use to be slight, at most. That is because people are better educated now in water use efficiency than they were just a few years ago, she said in an email. Not only that, many Californians installed more efficient appliances during the drought and replaced water-hogging lawns with drought-tolerant California native plants – actions that should translate into permanent savings. Drought or no drought, statewide, per capita water use has been declining for decades in California. In the Santa Clara Valley Water District in Silicon Valley, a so-called cash-for-grass program encouraging replacement of lawns with drought-tolerant plants has contributed to a 20 percent reduction in water use since 2013, according to John Varela, chairman of the district’s board of directors. “Our rebates have resulted in more than 10 million square feet of conversions to low-water using landscapes,” Varela said. He expects this long-term change in landscaping to correlate to a long-term reduction in water demand. Other areas keeping up with conservation include the Sacramento Suburban Water District, the Moulton Niguel Water District in Orange County and the San Francisco Public Utilities Commission, which have all reported that residential customers not only cut their water use significantly during the drought but have maintained a high level of conservation since mandatory state level conservation targets were lifted. But it’s not all good news. Fresno, Palo Alto and Brentwood have all seen sharp spikes in per capita water use in the past 12 months, according to records from the State Water Resources Control Board. The city of Banning in Riverside County did very well during the drought, cutting June per capita water use from 190 gallons per day in 2014 to 76 gallons in 2016. Then, after mandatory conservation targets were lifted, per capita consumption hit 140 gallons per day in June 2017. The nearby city of Norco did even more poorly. Though the 26,000 residents cut their water use drastically from about 231 gallons per day in June 2014 to just 63 in June 2016 – possibly the best conservation performance in the state – daily per capita use bounced back to 206 gallons by June 2017. Such patterns are likely due to varying levels of restrictions on outdoor watering. The Pacific Institute’s Cooley says landscaping needs amount to about 50 percent of California’s residential water use. Another contributing factors is that many residents merely allowed their lawns to turn brown during the drought. “And they’ll probably start watering their lawns again,” said Deven Upadhyay, the water resource manager of the Metropolitan Water District of Southern California, a wholesaler that distributes water to 26 retail agencies serving 19 million people. Drought or no drought, statewide, per capita water use has been declining for decades in California, though, Cooley says. In many residential communities, overall water use has declined, too. “And that’s in spite of population growth,” she said. In San Francisco, for example, total water use is down even though the city’s population has grown by 100,000 people, to 880,000, since 2000. The East Bay Municipal Utility District’s collective water use has also been dropping for at least 17 years while the region’s population has boomed. In Southern California, too, there are now more people than ever before. Yet demand for water hasn’t been so low in decades, says Upadhyay. He says his district was selling 2 million acre-feet of water each year in 2013. In the most recent water year, Metropolitan sold 1.5 million acre-feet. Cooley says this long-term trend is due largely to more efficient water use in outdoor irrigation, drought-friendly gardens coming into fashion while green lawns go out of style and residents installing more efficient toilets. The standard toilet, she says, used about 6 gallons per flush in the 1980s. Today, most toilets flush barely over a gallon. Flushing toilets, she says, amounts to about 15 percent of the average residential water bill, and 30 percent of a home’s indoor use. People have also learned to use water more efficiently, in large part by “not letting it flow onto the sidewalk or by flushing fewer times each day,” Cooley says. 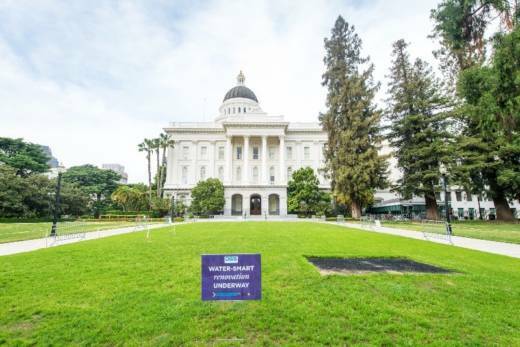 Though people in some regions of California seem to have abandoned strident conservation efforts, Cooley believes statewide efficiency will continue to improve, at least on a per capita basis, and she commends Californians for their efforts to conserve water.